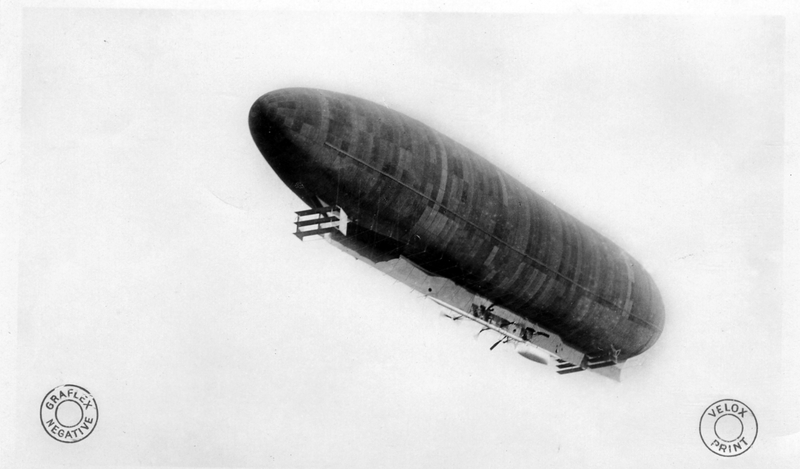 This is a wonderful photo of the American semi-rigid airship “Akron”. Melvin Vaniman, a well known American photographer, persuaded the Goodyear Tire & Rubber Company in Akron, Ohio to finance the ship. It was named “Akron” and was completed in autumn 1911 and made a short trial flight in the first week of November. Then the “Akron” was laid up for the winter break and some modifications were made, especially to the auxiliary equipment. In summer 1912 Vaniman made some demonstration flights and tests. On July 2, 1912 the “Akron” left Atlantic City with Vaniman and three other crew members and headed out to sea. Fifteen minutes later the envelope exploded and the airship crashed into the sea killing all four men on board. The cause was never established, probably there was a problem with a new type of valve. An interesting story on many levels, not least in connection with the curator's German name. Ein alter Zeppeliner? Which museum in Akron has exhibits dealing with that city's airship heritage? Perhaps one of the locals can help with that. A quick google search shows a "Akron Airship Historical Center", but not much more than the address.